The Rules Do Not Apply is a must-read for every woman out there; it takes you through the various experiences women go through. This tells the story of Ariel Levy, a thirty-eight-year-old reporter for The New York Times, who talks about her moments in love, motherhood, and work. This book tells the heartbreaking and warming journey of a woman who simply wanted it all, no matter the rules. What’s intriguing about this book is how relatable it is. Women have shown acclamation for Levy’s story and have empathized with her. She touches on various events which possibly every woman has lived at least once in her life, or probably will. And even if you’ve not, you’ll still feel her journey truly and deeply. It’s refreshing to read about all these moments from a female voice. 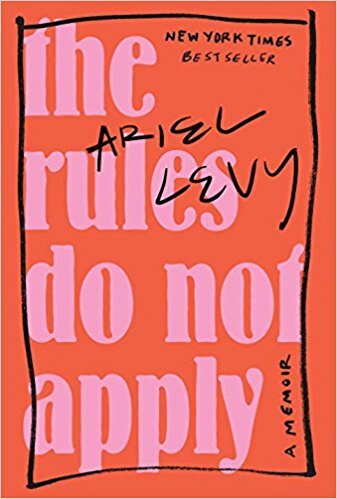 “Ariel Levy seems to be living out the unlived lives of an entire generation of women simultaneously. Free to do whatever she chooses, she chooses everything,” said Alison Bechdel, a cartoonist and writer, about The Rules Do Not Apply. The book’s main characters are all women, except for Levy’s dad. The female characters of the book are all shown in a light for which, even when they’re doing something wrong or considered immoral, judgement is never an option. Her flowy narration, plus her choice of words, are so personal that not much is left to do but to empathize with every character. Of course there are times where you most definitely disagree with certain decisions and characters, but the narrative is too raw and intimate to not touch your heart. One of the most important subjects Levy explores in her book is motherhood. She narrates her relationship with her own mother as well as her own personal experiences. Levy and her mother share a unique bond; in a way Levy is her own mother re-invented. The bond between them is strong and this strength is narrated in all its genuine self throughout. Her mother lost both breasts to breast cancer, plus was the primary breadwinner of the family (she made more money than Levy’s father), making her a respected, strong female character. She also talks about her own unique journey with motherhood as she battles with pregnancy and her career, having to make tough decisions in order to fulfill her dream of becoming a mother at the age of thirty-eight. The Rules Do Not Apply, is a memoir discussing all the unique, difficult, amazing journeys women partake in. This is a book that will be impossible to put down.